A lot of these types of ingredients can be good and bad for your relaxed or natural hair. So which are which? The lists of ingredients provided below came from extensive online research. They also came from researching ingredients listed on the hair products I use on my relaxed hair. While these lists do contain several ingredients they are no way exhaustive and are meant to be a guide. Which ingredients work best vary from head to head. Particularly what is called short chain alcohols. They have small molecules and quickly evaporate which can result in dry and frizzy hair. The alcohols with "prop" in the name tend to be the most drying and should be avoided by those with relaxed hair and hair that tends to be naturally dry. Yep. Not all conditioners are good for your hair. The ones to avoid are those that are non-water-soluble silicones because they cause buildup on hair strands and block the penetration of moisture. 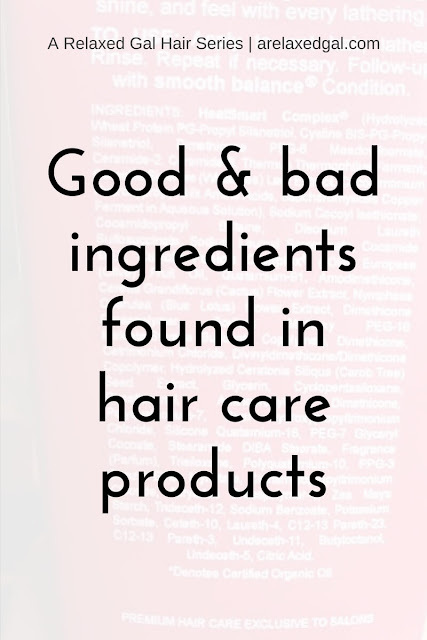 The not so good preservatives are parabens and include propyl, methyl, butyl, and ethyl. Cetyl or ceterayl alcohol which is a non-sticky and non-greasy ingredient. It's typically used in conditioners for dry hair. This alcohol makes the conditioner creamy and thick. It's made from vegetable oils such as coconut and palm oils. Stearyl alcohol is an emollient made from stearic acid (animal fat), cocoa or shea butter. Water which is the best, most natural moisturizer out there. Glyceryl stearate an emollient that makes hair products smooth and creamy. It also helps with locking in moisture. Behentrimonium methosulfate is a hair detangling ingredient that is gentle in nature and doesn't coat the outside of the hair shaft but penetrates it. They absorb moisture from the air. Some humectants include are glycerin, vegetable glycerin, honey, and panthenol. Natural oils are the best type to use because they are the most beneficial. They also have multiple uses not just for the hair, but also for skin and cooking. Here is a short list of natural oils that are commonly listed in hair product ingredients. Coconut oil penetrates the cortex making it a unique oil because it can help with moisturizing and strengthening strands from the inside out. Jojoba oil is unique in that it closely resembles the sebum the scalp produces. Arian oil moisturizes and has antioxidants that are beneficial for weakened hair. It helps fight frizz and provides shine. Avocado oil is a nourishing oil that helps with the softness, smoothness and ultimately health of the hair. If you choose to skip the paragons, here are some more natural alternatives. Potassium sorbate is a natural preservative that can be found in may foods. Cedric acid which provides short-term preservation. Tea tree oil which can preserve products for a short time. They help to repair the structure of the hair strand and thereby strengthen it. Proteins can be strong/heavy or gentle. Strong proteins include keratin which strengthens the hair shaft reducing breakage and collagen which increases hair elasticity. Commonly used gently proteins are hydrolyzed wheat protein, silk amino acids, hydrolyzed silk protein. 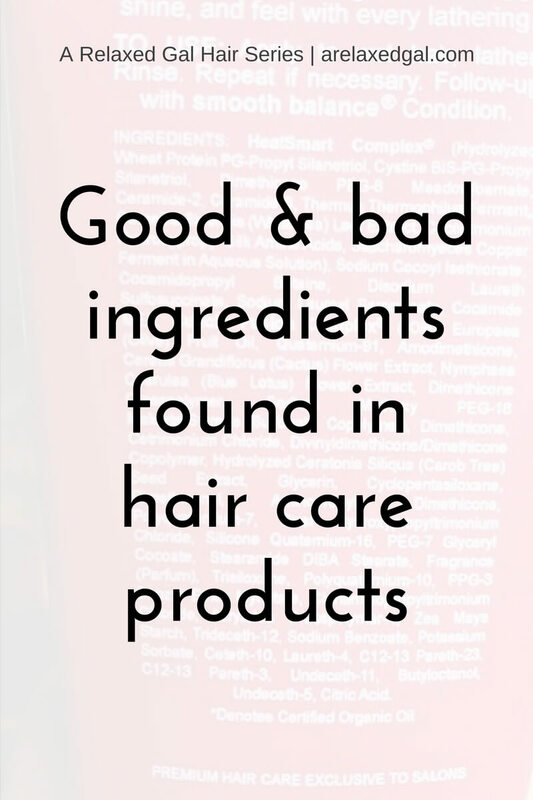 What ingredients do you make sure are/aren't listed in your hair products?